This tender portrait of the two eldest sons of George Tonwshend, 1st Marquess Townshend (1724 – 1807) of Raynham Hall, Norfolk and his first wife, Charlotte Compton, Baroness Ferrers and Compton (d. 1770), was until recently misattributed to Francis Cotes (1726 – 1770), whose pastels showed the influence of the renowned Venetian (and female) pastellist, Rosalba Carriera (1653 – 1757). Arguably, this sensitive portrayal of young boys, in the ‘feminine’ medium of pastel, has a distinctly maternal touch. It would have been for this very reason that the London-based Scottish pastellist Katherine Read, herself a ‘disciple’ of Carriera, was commissioned to produce this intimate, family piece. Private collection, Germany, until 2018. J. Durham, The Collection of Pictures at Raynham Hall, privately printed 1926, p.32 (as by Cotes). F.D. Singh, Portraits in Norfolk Houses, Norwich 1928, Vol. II, p. 238, no. 18 (Located in the Agent’s House, property of Mr. James Durham and Lady Agnes Durham, 21st January 1924, as ‘by F. Cotes’). E.M. Johnson, Francis Cotes, London 1976, p.169, appendix VI, no. 57 (first time Cotes attribution questioned, attributed to Katherine Read). J. Ingamells, National Portrait Gallery: Mid-Georgian Portraits 1760 – 1790, London 2004, p. 462 (attributed to Cotes). In the 18th century, pastels and miniatures were an acceptably feminine domain in which women artists could flourish, and indeed influence, their male counterparts. By the mid-1760s Read, who had trained in Paris and Rome, was practising in London’s fashionable St. James’s, and had come to the attention of aristocratic circles, even gaining the patronage of Queen Charlotte. The present portrait would have been commissioned shortly after Read exhibited a portrait of the Queen with the infant Prince of Wales to great acclaim at the Society of Artists in 1763. Read’s talent for portraiture was so highly regarded at that time that she was even the subject of an epistle by the poet and picaresque author, Tobias Smollett (1721 – 1771): ‘Let candid Justice our attention lead,/ To the soft crayon of the graceful Read’. 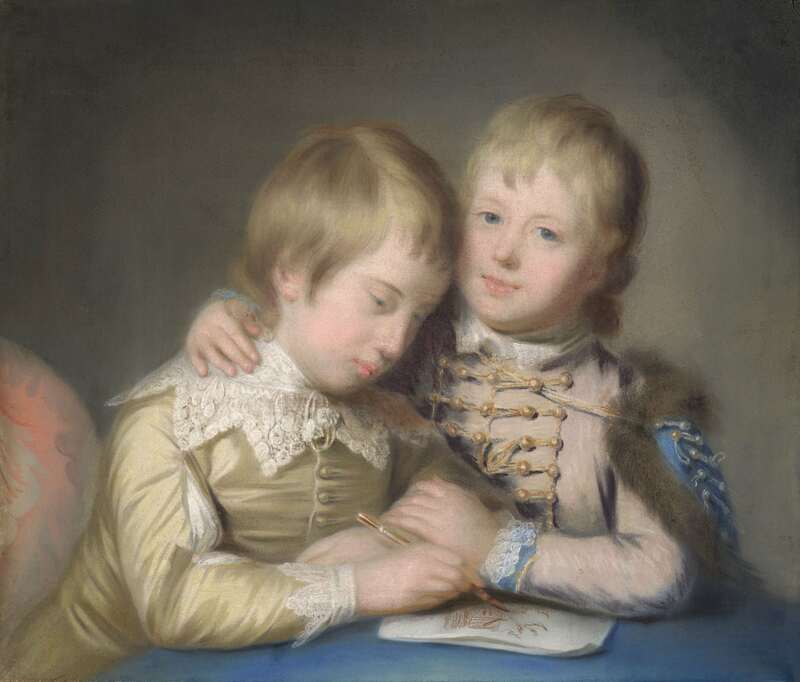 Here, we see the young heir, George Townshend, aged around ten or eleven, seated at a table and absorbed in drawing a landscape, while his younger brother John, aged seven or eight, holds George in a brotherly embrace, directly looking at the viewer.It is a clear moment of brotherly affection, whilst also a reference to George’s more serious role as elder sibling and heir to the marquisate. The soft blending of Read’s pastel touch lends itself to the innocence of her subjects. With gentle highlights to their blonde hair and the dull gold satin of their suits, delicate rendering of lace, and clear touches of blue in John’s eyes, attire and to the tablecloth, the palette is distinctly rococo. George Townshend, later second Marquess Townshend (1753 – 1811), grew up to become a keen amateur artist (rather aptly given his childish sketch here), but was most famed as an antiquary and politician. On his mother's death, on 14 September 1770, he succeeded to the baronies of Ferrers (also known as ‘de Ferrars’) and Compton. He was educated at Eton and St. John's College, Cambridge and as a young man also served in the army, becoming captain in the King's light dragoons on 31 December 1771. Relations with his father broke down in 1774 as the 1st Marquess was heavily encumbered by debt, and needed the agreement of his son to redistribute the entail on the family estates. George agreed reluctantly, but on terms his feckless father found objectionable. In 1777, at Lambeth Palace chapel, George married Charlotte (1754 – 1802), the second daughter and coheir of Eaton Mainwaring Ellerker of Risby Park, Yorkshire, and they had two sons. George was particularly interested in heraldry and archaeology, which Walpole referred to as his ‘violent passion for ancestry.’ In 1784 he was created earl of Leicester, and so he particularly associated himself with the antiquities of Leicestershire. John Throsby, the historian of Leicester, dedicated his history to him, and John Nichols acknowledged his assistance in the preface to his history of Leicestershire, the first volume of which was dedicated to the earl. The year of his creation as Earl, he was swiftly elected to the council of the Society of Antiquaries, and made a vice-president, with his planned election as President later that year. He brought social and fashionable cachet to the society, which had recently moved to accommodation in Somerset House, with a view to increasing members from ‘polite society’. In 1787 George became a trustee of the British Museum and he continued as president of the Society of Antiquaries until his sudden death in 1811. He was buried on the family estate at Raynham, Norfolk. Yet, in spite of the achievements of the 2nd Marquess as a respectable antiquary, and the political clout of his younger brother John, nonetheless there was a streak of madness in the family that played out in 1796 as a tragedy between their two younger brothers Charles (1768 – 1796) and Frederick (1767 – 1836). That year, Lord Charles, who had just been elected MP for Great Yarmouth, took a carriage with their youngest brother, Rev. Lord Frederick, Rector of Stiffkey. During the journey, Frederick inexplicably murdered Charles with a pistol shot in the head. He was declared insane by jury and institutionalized for the rest of his life. It was a scandal that touched the lives of the family, and even John would later be described as mad by some of his peers. Katherine Read was born into a rich Jacobite family in Dundee in 1723, one of thirteen children of Alexander and Elizabeth Read. Her maternal uncle, Sir John Wedderburn, 5th Bt. of Blackness, fought in the Jacobite rising of 1745, for which he was executed. Shortly after, the family sought sanctuary in Paris. There, Katherine’s nascent career as an artist blossomed. It is thought that her contemporary, Robert Strange (1721 – 1792), himself a Jacobite artist in exile, introduced her to the French artistic milieu. In Paris, she studied with the pastellist Maurice-Quentin de La Tour (1704 – 1788), whom she would later refer to as ‘my model among all the Portrait Painters that I have yet seen’. Following the Young Pretender’s expulsion from France in 1748, Read followed many of the Jacobite contingent to Rome, where she arrived in late 1750. There she was befriended by the abbé Peter Grant, the agent in Rome for the Scottish Catholic Mission, and studied oil painting with the French artist and winner of the ‘prix de Rome’, Louis-Gabriel Blanchet (1705 – 1772). Read’s connections ensured that she had access to leading patrons, most pivotal being cardinal Alessandro Albani (1692 – 1779), who opened his collection to her. After Katherine copied four heads by Rosalba Carriera from his collection, Albani himself sat to her, evidently pleased with her endeavours. It is speculated that Katherine may even have met Carriera through the cardinal at this time. She remained in Rome until 1753, when she decided to try her fortune in England, with the assistance of Albani, who helped habilitate her reputation, regardless of Read’s family’s alignment in the war. She set up her residence in St. James’s Place and later in Jermyn Street, where she soon established herself as the most fashionable pastellist to aristocratic sitters, notably portraits of women and children. At this time, Read exhibited in London at the Society of Artists (1760 – 1772), of which she became an honorary member in 1769 along with two other female pastel artists Mary Benwell and Mary Black, in response to the Royal Academy accepting Angelica Kauffman and Mary Moser. Later, she left to join the Royal Academy, but was expelled from the Society as a consequence. She exhibited at the R.A. from 1773 – 1776. At this time many of her works were engraved and reproduced by popular demand in mezzotint by Valentine Green (1739 – 1813) and James Watson. In 1777, with her popularity waning due to a wave of pastellist artists in her wake, Read left England for India as a chaperone for her niece and pupil, Helena Beatson (1763 – 1839), whose father (and Katherine’s brother), William Read, was a surgeon in the East India Company’s service. Helena was destined to find a husband, ultimately marrying Sir Charles Oakeley Bt., Governor of Madras, and Katherine set up a practice there painting portraits of the English officers. But, with her health deteriorating, in December 1778 she set sail back to England, sadly dying at sea on the return voyage. The Gazeteer and New Daily Advertiserof 31.VII.1764 stated that: ‘The celebrated Miss Read, who is now in France for the benefit of her health, was, last week, made Painter in Crayons to her Majesty.’ The following year the same journal reported (5.II.1765) that ‘their Royal Highnesses the Princess Louise and Princess Caroline are sitting to the celebrated Miss Read for their portraits in Crayons’, and in 1765, Read exhibited a pastel of the young Prince of Wales with his brother, Prince Frederick. George did not play a major political role in the House of Lords, although when the Whigs returned to office in the spring of 1782 he was made a privy councillor and was nominated captain of the band of gentlemen pensioners. In 1784 he was named a member of the committee of the privy council which managed colonial commerce until the Board of Trade was constituted. He was master of the Royal Mint from 1790 to 1794 and held the office of joint postmaster-general from 1790 to 1799. That year he was named lord steward of the household, an office which he held until August 1802. On the death of his father in 1807 he succeeded as second Marquess Townshend. George Ferrars Townshend, who succeeded his father in his titles but was disinherited from the Raynham estate in Norfolk, and Charles Vere Ferrars. Gentleman’s Magazine (1833, i. 369). Ingamells, 2004, p.462. *At least one of his brothers, Reverend Lord Frederick murdered his brother Lord Charles in a coach journey to London in 1796. Neil Jeffares, Dictionary of pastellists before 1800, on-line edition, www.pastellists.com, Katherine Read, p. 1. Read’s early portraits in London, shortly after her return from Rome, such as Mrs Garrick (c. 1755; London, V&A), share the tilt-headed pose and soft modelling of Carriera’s work. Simon and Ethelred Yorke (c. 1775; Erddig, Clwyd, NT) is a typical double portrait of children in an oval format. A pair of plates, by J. Finlayson, of the celebrated Gunning sisters, the Duchess of Argyll and Countess of Coventry, were particularly popular. Including Francis Cotes (1726 – 1770), Margaret King (active 1779 – 1787), Daniel Gardner (1750 – 1805) and John Russell (1745 – 1806).